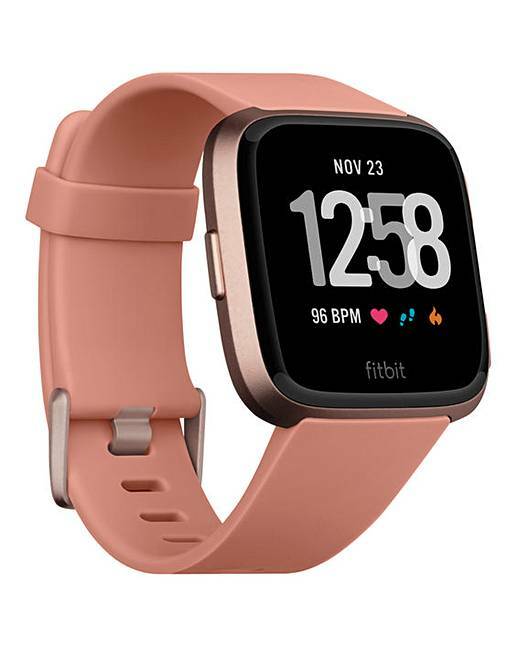 Fitbit Versa Peach Rose Gold Aluminium is rated 4.6 out of 5 by 14. This lightweight, water-resistant smartwatch helps you reach health and fitness goals with personalised guidance, on-screen workouts and more. You can also stay in touch with notifications, quick replies, apps and music. We also love the fact you can wear it your way with fresh accessories and clock faces. The 4+ day battery life makes life easy too. Fitbit Versa does all the things you traditionally associate with the brand, including fitness tracking for activity including steps, distance, floors climbed, active minutes and calories burned to show how every part of your day makes an impact on your fitness goals. You also get reminders when you need to stay on track toward your goals with personalised advice to stay active and get hydrated. You can also see your resting heart rate trends and discover your cardio fitness level. You even get personalised guided breathing sessions to help you relax based on your heart rate. Get a better understanding of your sleep quality, with helpful insights about each night to help you set a sleep schedule. It automatically tracks time spent in light, deep and REM sleep stages. Stay connected with call and calendar alerts, text notifications and quick replies, plus updates from your favourite apps, like Whatsapp and Facebook. Your favourite apps for fitness, finance, social media, sports and more are just one tap away. There's also a Female Health function in the Fitbit app to log your period, record symptoms and compare your cycle against other health stats like your sleep, activity and weight. Store and play 300+ songs, no phone needed. Use 15+ exercise modes like Run or Swim to record workouts (water resistanst to 50m). See notifications for calls, calendar events or texts & send quick replies. Start personalised workouts on-screen with Fitbit Coach. Connect to smartphone GPS for real-time pace & distance on screen, plus get a map of your route in the Fitbit app. Get health insights & personalised guidance in one place on Fitbit Now. One Size - Includes Small and Large strap. Rated 5 out of 5 by Christine from Great Features Upgraded from the Fitbit Alta. Very,very pleased with it.There is so much on it. Rated 5 out of 5 by Chevy1985 from Amazing Watch Well worth the money!! This really does the business. Everything you would want is included. It’s waterfproof too which is a great feature in order to gain real-time info on your swim. Love it! !